Thanks to Chevrolet we were able to tour in safe comfortable luxury from our SoCal mountains to our coastal OC beaches and maybe even girl scouts, soccer and the school pick up line too. All opinions and experiences are my own. 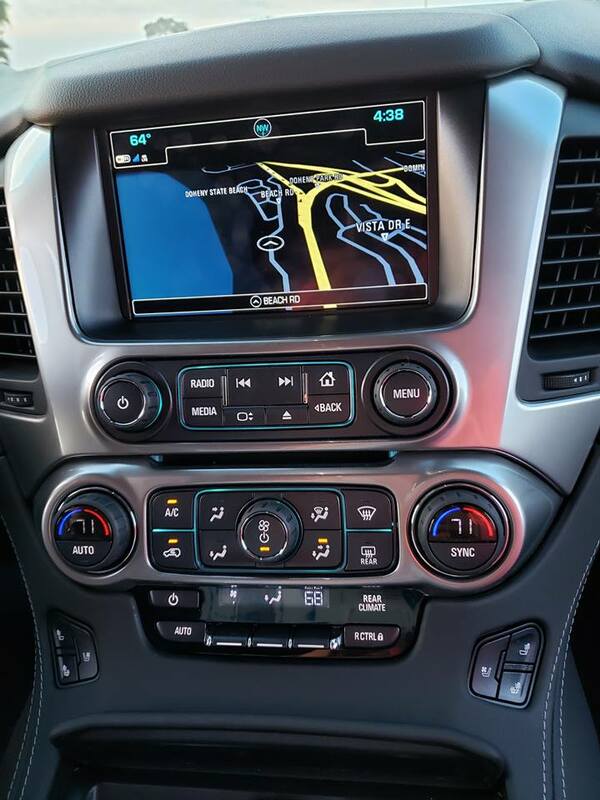 I wanted to share what really stuck out to me in the test drive as a notch above the rest for travel, safety, entertainment and comfort. Comfort and Family Perfect - Seating seven(option for eight available), with captain seats in the middle, the entry of kids and taller sized people is super convenient. My husband is 6'3" and I'm 5'7"... even our 10 year old is 5'6" and we piled in a car seat for the 6yo & others for a comfortable fit and drive. 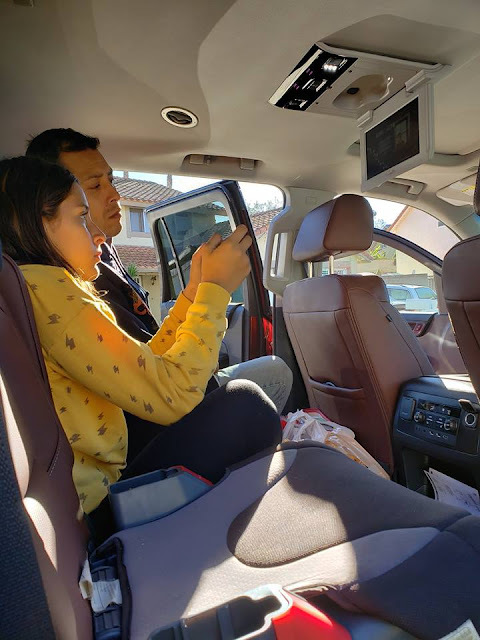 Entertainment - Aside from Apple and Android auto capabilities there are also Rear-Seat Entertainment System with Blu-ray® playback available as add-ons. The audio sounded clear and played both the movies and satellite radio on point. I love that this can come factory with warranty too. 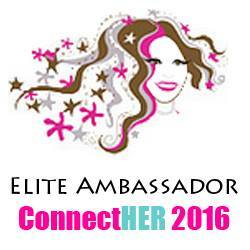 I've had aftermarket audio and it's not better these days from my experience. Safety Features - With sensors everywhere there is a kind reminder or heads up to almost every off route move you make. There is even a reminder to check your back seat. Groceries, pets, kids... not that one would intentionally leave anything in the car but helpful reminder anyways. While in reverse I felt my seat vibrate and was shocked at how the sensor was reacting to the basketball hoop at the end of our driveway to alert me all around. Visibility- wide view even with the TV monitor screen down. 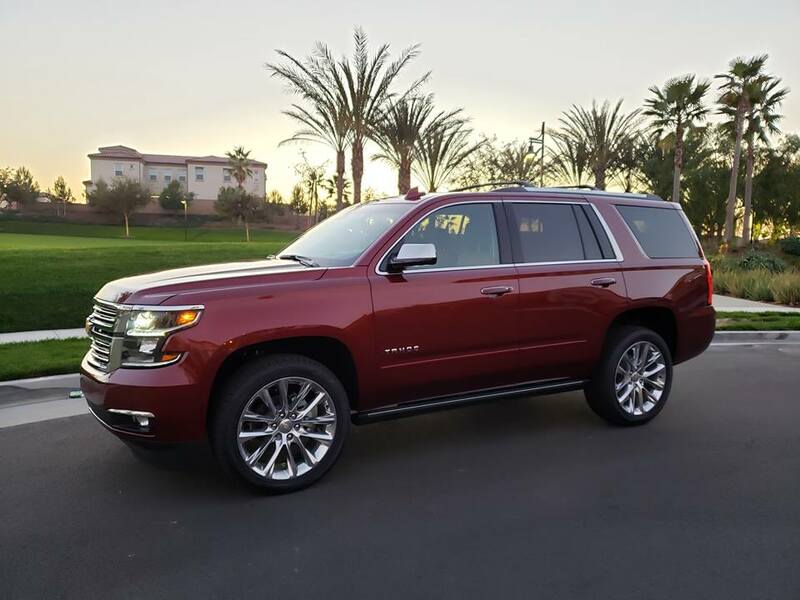 The rear vision camera is clear and sharp showing you the entire space behind the Tahoe. Cross traffic alerts are helpful when there's a lot of girl scouts or soccer team in the Tahoe singing and playing games! The rear parking assistant combined with the blind spot zone alert bring safety tech to the next level. Durability and Strength - From climbing mountains to cruising the sand beach side the drive was comfortable, confident, safe and a lot of family fun! The curves of the mountain felt as if I was in a coup low to the ground with the center of gravity still and sturdy. 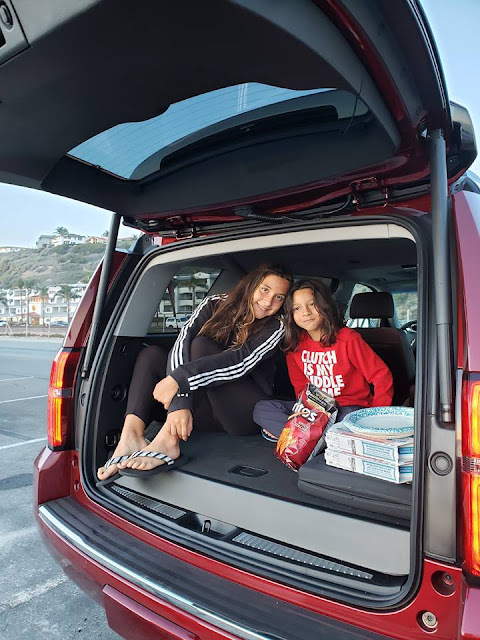 Cargo or Passenger ready with Easy Fold Down Seats - I'd love to say it's perfect for all but I'll speak for myself when I say this soccer, girl scout, adventure seeking mom loves how quick and easily accessible the seats manipulate. 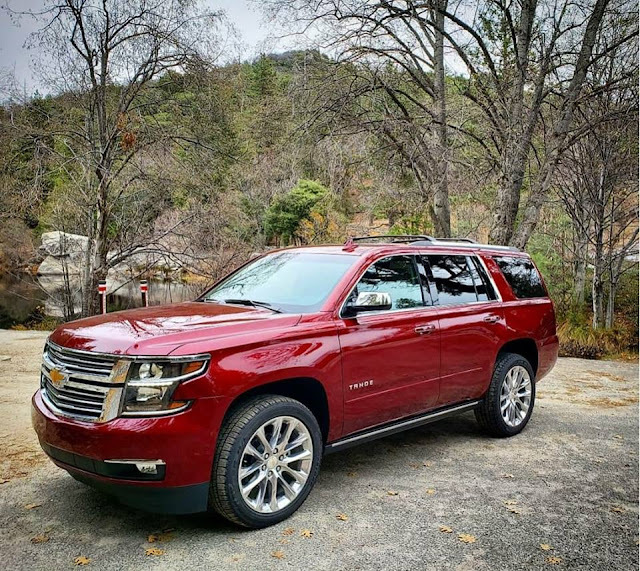 With V8 horsepower and 22mpg the Chevy Tahoe really surprised me on how many miles we were able to travel in the tank of gas! From Orange County to Idyllwild in the Mountains and back with plenty to spare for more travels. 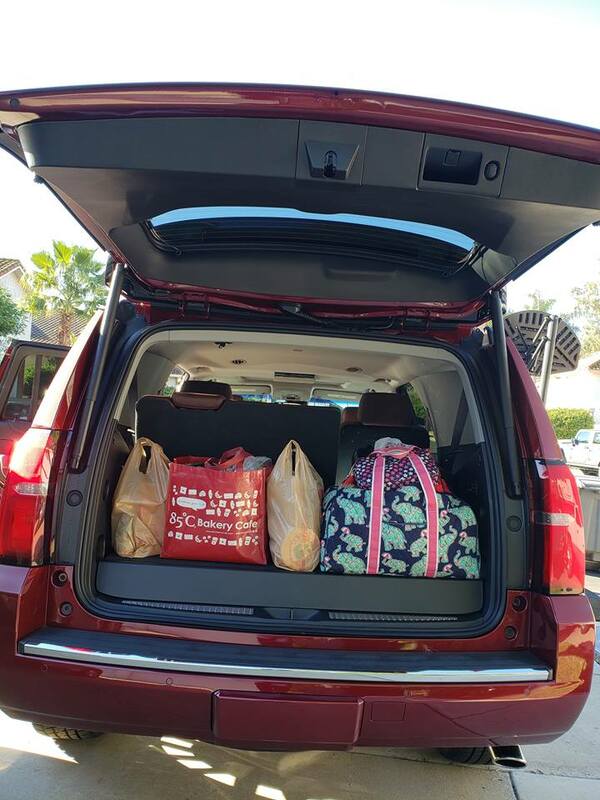 With the ability to seat 7 or 8 there's room for larger families, friends to tag along, carpools, cargo, multiple car seats and more. While there are nine colors to delightfully select from, I'm not going to lie, the Siren Red Tintcoat color had my heart racing! I mean my holiday dress even matched. Starting at 48k I was so surprised at all the bells and whistles that accompanied the top notch in technology safety features. The navigation was spot on whole in the mountains as well as around town locally. I do love how the Navigation screen slips down and you can place items right behind it. Perfect for mom life and quick access gold Fish snacks to toss to the back seat.. just saying! "Tahoe offers advanced active safety features like Adaptive Cruise Control - Advanced, Rear Cross Traffic Alert and Forward Collision Alert. You can drive with added confidence knowing Tahoe can help you prevent a potential collision." I love that Chevrolet takes high priority in safety features. I want to remind you that our test drive even had seats that would vibrate in account with the safety system sensors and cameras. Best option!! Just Amazing! Shocking at first when you don't know but none the less brilliant. As a mom carrying precious cargo I would totally suggest you look at and review your options with the Tahoe when SUV shopping if any of the above had you saying "oh, I like that too or that's important to me too". Cup Holders - the kids loved that there were plenty of places to store their water bottles, juices or friends drinks too. I loved that as well since I am a fan of coffee and water with me at all times! Entertainment System - I totally forgot to connect them to the WiFi that was available but they loved watching movies in surround sound or with headphones on. A bonus for longer drives. We often have out of area soccer tournaments. Space - the kids noticed that there was a lot of space and room to move around, pack in and settle down. No one felt cramped in any of the seats and while we traveled to the mountains with a full load of cargo, everyone was comfortable too. 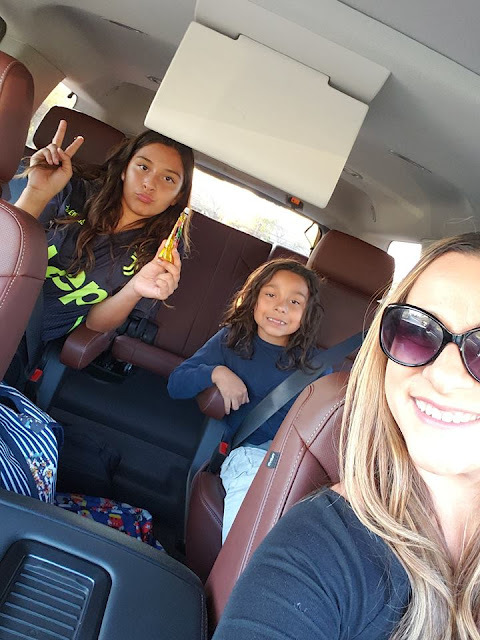 Heated and Air Conditioned Seats - Maybe it's a kids favorite cause they seem to forget their sweatshirts over under dress when I've reminded them to layer up but none the less the heated seats are a huge hit for us all. I personally loved the heated steering when we drove to the mountains but the kids absolutely loved the heated seats after soccer and while out in the evenings. I know they would enjoy the cooling seats as well in the hot summer when coming home from the beach. The Color - My son to a huge liking to the Siren Red color we test drove. It was memorizing and he just fell in love. He really wants us to have a red car... now he wants us to trade in our mid size SUV for the Siren Red Tahoe. He has my style of car goals there! 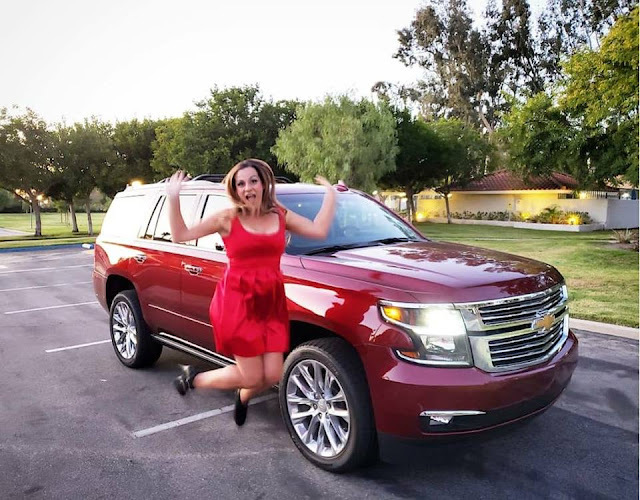 It was an adventurous test drive by purpose to put her to the test but we fell in love with the Chevy Tahoe Premier by choice, it was too easy to appreciate all she has to offer. 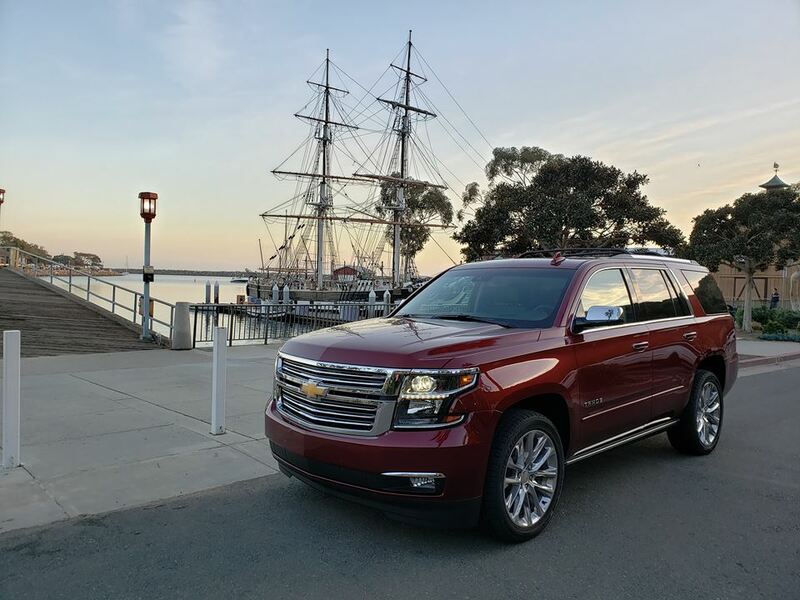 Please check out some of our video recaps here and live tours of the Chevy Tahoe during our test drive here. 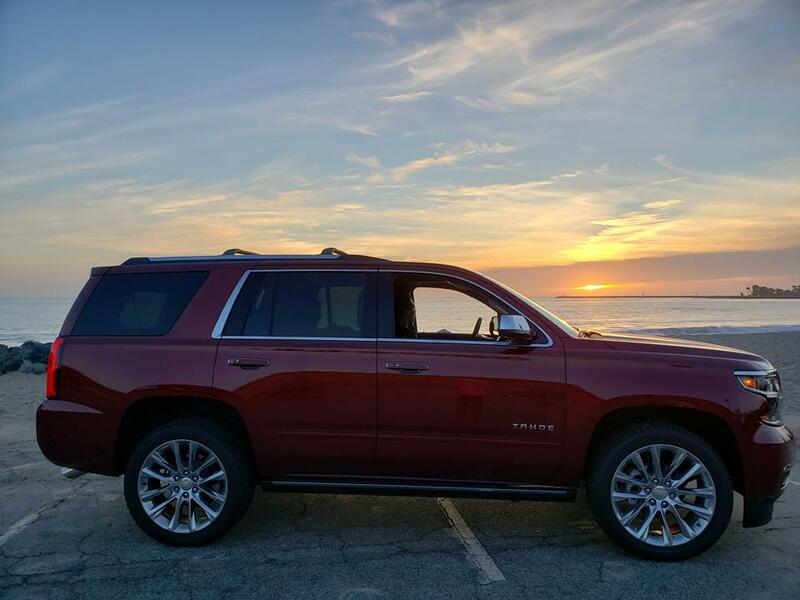 It's a great way to get a more personal look inside the Tahoe before heading to the dealer too. Oh, you can also follow #ChevyTahoe and #FindNewRoads for all the latest and greatest about all things #Chevrolet . 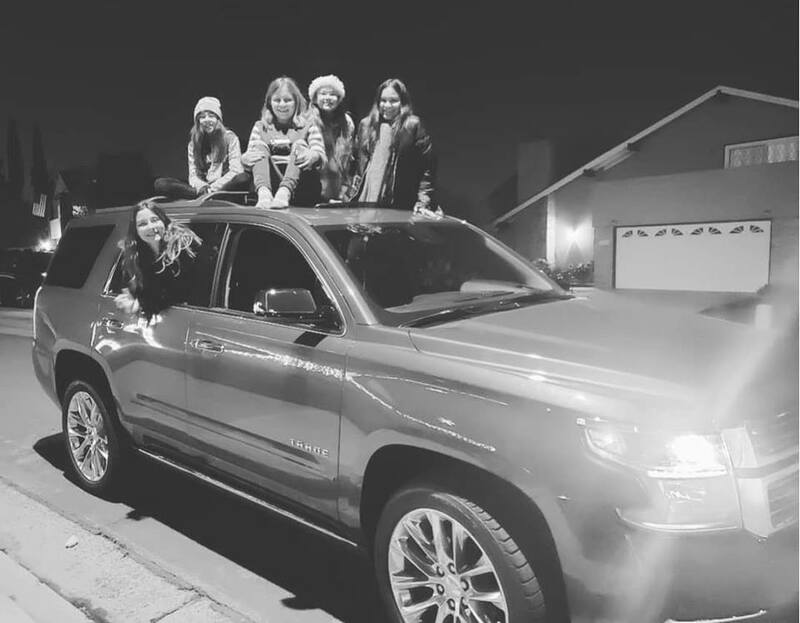 Chevrolet just shared some awesome tips on Winter Driving and Road Trips. Don’t Drive on Empty: Bad weather can cause unexpected delays, so keep your gas tank at least half full and your cell phone charged. Prepare Your Car for Winter: Have your dealer or a trusted mechanic do any scheduled service. Make sure your battery, tires, lights, wiper blades and other critical parts are ready for winter. Check tire pressure, as it can drop as the weather gets colder. Consider Winter Tires: Winter tires provide added traction in snow and ice, even for vehicles with four-wheel-drive or all-wheel-drive. If you drive regularly in winter weather, a set of winter tires can be a smart investment. Know Your Vehicle: Review the sections of your owner’s manual covering antilock brakes, traction control, and four- or all-wheel-drive (if equipped) to make sure you are comfortable with their operation. For quick and easy access to your owner’s manual, check out the myChevrolet app. Stock Your Car: In addition to a snow brush and ice scraper, it’s a good idea to carry a snow shovel and abrasive material such as sand or cat litter. Jumper cables, a flashlight and emergency flares can help if you encounter unexpected problems. Cold weather clothing and emergency blanket or sleeping bag can be critical if you are stuck or stranded. 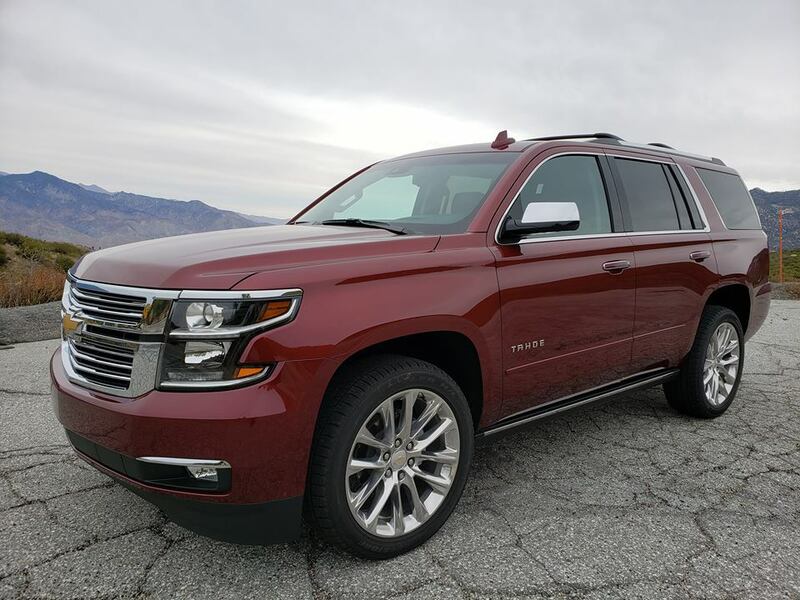 Live video chat about the Chevy Tahoe 2019 Premier here. 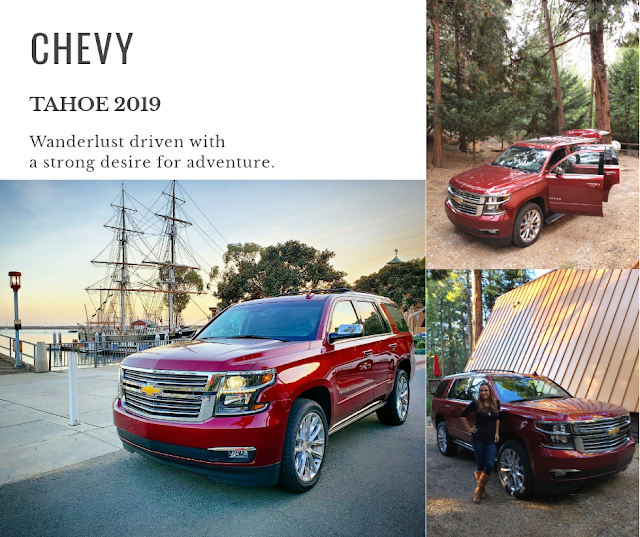 Have any questions about our test drive or the Chevy Tahoe, please, drop them in the comments or visit Chevrolet here!